As campus-based St Patrick’s Technical College students return to classes this week, one Year 11 Building and Construction student is doing something a little more impressive. Lainie Thomson’s love of horses and gymnastics has taken her all the way to Europe instead. 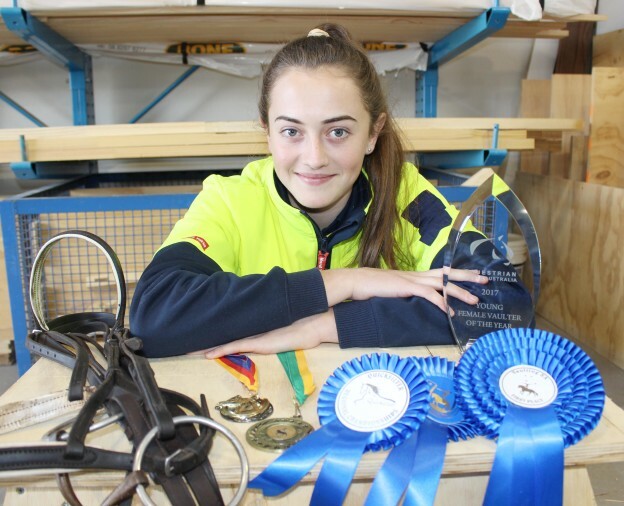 Currently in Germany as part of an Equestrian Australia young exchange program, Lainie, 16, is the SA 2017 Junior Vaulter of the Year. Equestrian Vaulting combines gymnastics and horsemanship skills. It requires great rhythm, coordination, balance and trust between rider and athlete. Riding to music, athletes must complete compulsory moves and freestyle routines and Lainie has been part of the Quicksilver Competition for two years, training out of Cockatoo Valley. “I really like horses and I did gymnastics for five years,’’ Lainie said before her trip. But once Lainie found her balance, she progressed quickly in the sport. Her favourite move is called a flic-flac, which is a backflip off a moving horse. As one of about a dozen young people from Australia who have travelled to Germany as part of the Equestrian Australia’s exchange program, Lainie said she was looking forward to watching a major competition in Frankfurt. Lainie, and her mum Toni who has accompanied her, will be billeted with different German families during the stay. Later this year, Germany will send a group of its talented young equestrians to Australia. Lainie and her mum will take the opportunity to visit friends in the Netherlands and Greece following the exchange. For the future, Lainie hopes to quality for the 2019 World Junior Equestrian Games. This entry was posted in Media Releases on 23/07/2018 by St Patrick's Technical College.